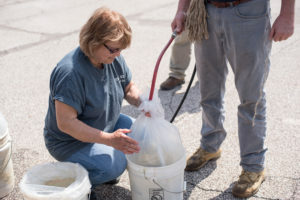 We go to Soil and Water Conservation offices throughout Ohio to deliver fish throughout the course of the year. You can call in an order to your local office, or the hatchery, and we will show up at a designated day, time and place, and you can pick your fish up. When picking up fish at the districts you will need to bring your own bucket or tank for the fish. Example: 1 bucket with a heavy plastic bag (clean) that is 1/2 full of water from your pond. Each calendar listing has the date and time as well as a map and contact information for the district so you can get location and other information for your fish pick up time! Each listing will also allow you to add the event to your phone or tablet calendar so you ensure you don’t miss the date! Keep an eye out on the calendar for other information like pond clinics, seminars, hatchery information and other dates that may be pertinent to you. When you meet us at the SWCD fish sale, we ask that you bring buckets with plastic bags and water from your ponds to transport the fish in. Here’s a photo of Cheryl putting oxygen in a customer’s bag so the fish make the trip home in good condition. 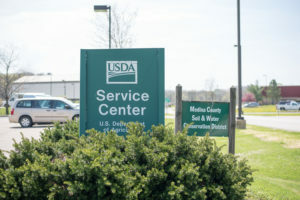 Soil and Water Conservation Districts are one of our main distribution centers for our fish sales. they’ve been a valuable asset to our business for the past 40+ years and will continue to be in the future.